Simplicity theme is designed to be fully compatible with the latest version of WHMCS (currently version 7.4.1) including all the latest WHMCS features, such as MarketConnect, automated SSL provisioning and management, spotlight TLDs, dynamic menus and sidebars. We release regular updates to ensure that all our themes continue to be compatible with future WHMCS releases. We're always interested in adding compatibility for additional third party addons/modules so please contact us if you would like us to add support an addon/module not listed above. Simplicity theme is built on the Bootstrap responsive design framework (version 3.3.7) and looks great across a wide range of devices and screen sizes including desktop, mobile and tablet. WHMCS version 6.0 saw the introduction of client area sidebars to provide additional contextual menus, such as data-table filters, common actions and quick links to other relevant pages, throughout the client area. Simplicity makes use Bootstrap’s inbuilt tabbed navigation functionality to present some of these menus in a more user friendly and intuitive manner. We’ve also incorporated bootstrap-tabdrop.js to improve the display of tabs on small screen sizes, for a completely responsive experience. Prefer the default sidebars to tabs? Not a problem. Our theme options allow you to choose between tabs, sidebars or a combination of the two. 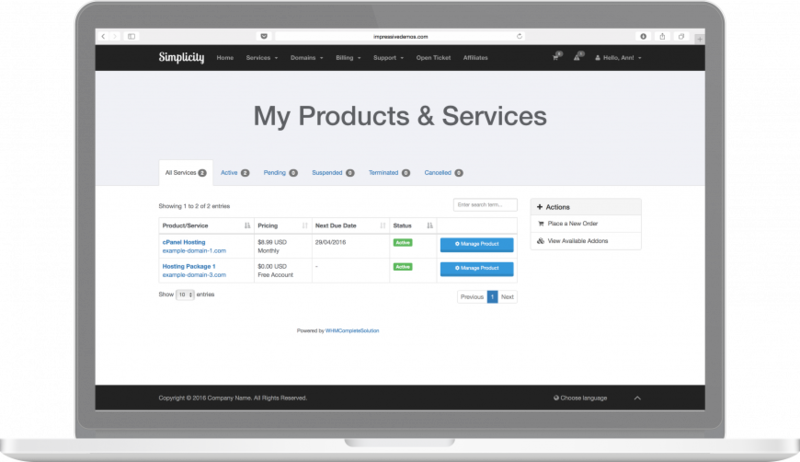 Simplicity theme for WHMCS includes matching invoice and quote templates. 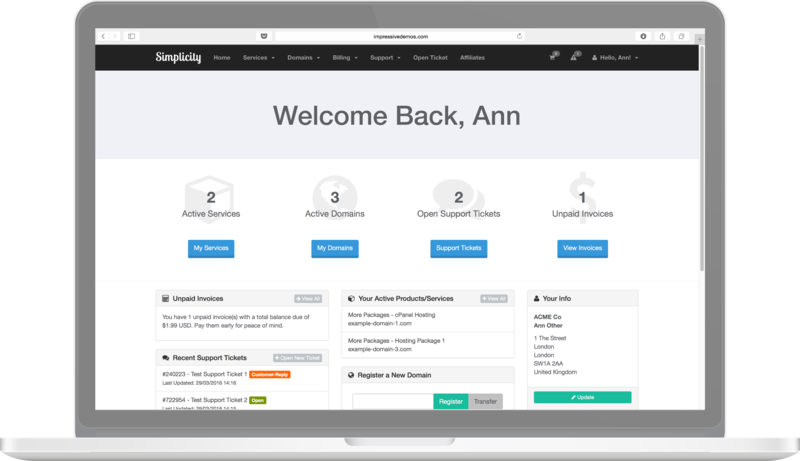 All of our themes come with one year of access to our customer support centre, including thorough documentation for all our themes and technical support via our support ticket system. We release regular updates for all our themes. This ensures that our themes continue to work with the latest version of WHMCS and enable us to respond to customer feedback and implement new features and functionality. We've had a few design issues with the theme, and the developers have provided a fix within hours every time. The Simplicity theme has a ton of settings that help customize the look and feel. Customer support is super nice and very helpful! Would recommend ImpressiveThemes to everyone! Thanks Dennis, glad that we were able to help you! If you have any further issues, please don't hesitate to get in touch. This release introduces full compatibility for WHMCS 7.7.0. Add new theme option to choose whether the sidebar is displayed on the left or right. Add theme option to choose between fixed width or fluid header. This version is compatible with WHMCS version 7.7.0. It is not compatible with earlier versions of WHMCS. This update adds support for WHMCS version 7.6.0, including updated icon support for Font Awesome 5.2.0. This version is compatible with WHMCS version 7.6.0. It is not compatible with earlier versions of WHMCS. This version is compatible with WHMCS version 7.5.0 - 7.5.2. It is not compatible with earlier versions of WHMCS. This version addresses an anomaly with the $carttpl variable on the domain renewals page, which prevented the page from loading correctly when called from a child order form template. We have identified an anomaly in the way in which WHMCS 7.5 returns the $carttpl variable (which we use to specify the path to a number of dependent template files) on the domain renewals page, when calling the parent order form template file from a child order form template. This is preventing the domain renewals page from loading, as it is unable to locate a number of dependent template files, when a child order form template, such as the comparison or slider order form template, is set is as the default order form template. We have logged this as an issue with WHMCS, however, this update provides a workaround for the problem, by using a relative path rather than the $carttpl variable to load the dependent files for this particular template page. This version introduces compatibility for WHMCS 7.5.0, including SiteLock integration via WHMCS Marketconnect, new marketing emails consent feature, new domain renewal process, domain pricing page and new product upgrade procedure. This version is compatible with WHMCS 7.5.0 only. It is not compatible with earlier versions of WHMCS. 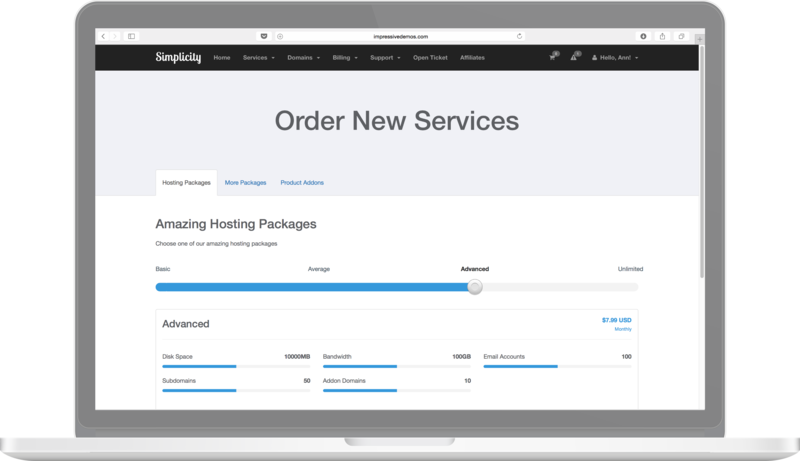 This version introduces compatibility for WHMCS 7.4.0 - 7.4.1, including improved phone number input and credit checkout options. This version is compatible with WHMCS 7.4.0 - 7.4.1. It is not compatible with earlier versions of WHMCS. This version introduces compatibility for WHMCS 7.3.0, including social sign-in integrations. This version is compatible with WHMCS 7.3.0. It is not compatible with earlier versions of WHMCS. This version is compatible with WHMCS versions 7.2.2 - 7.2.3. It is not compatible with earlier versions of WHMCS. This version introduces compatibility for WHMCS 7.2.2. This version also fixes an issue in the brand.tpl file in versions 2.3.0 - 2.3.1 which caused the pdf invoice logo, if specified, to override the theme logo. This version fixes a bug in the domainregister.tpl file in version 2.3.0. Updated for compatibility with WHMCS version 7.1.0.